KIEV, Ukraine -- Jailed former Ukrainian Prime Minister Yulia Tymoshenko has not been allowed to receive treatment in a specialized clinic outside of her prison, as recommended by German doctors, prison officials and supporters said Thursday. Tymoshenko, 51, the country’s top opposition leader, is serving a seven-year jail sentence on charges of abuse of office after a verdict condemned by the West as politically motivated. 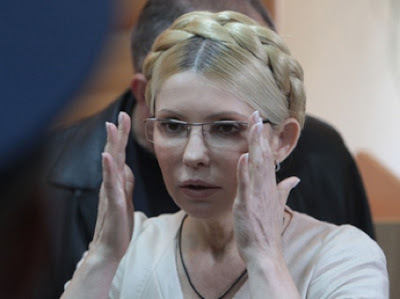 Tymoshenko has a spinal hernia and suffers from constant and intense pain, according to her daughter Eugenia Tymoshenko. German doctors have concluded after examining her that she urgently needs complex treatment, which should be conducted in a specialized facility, not in prison, in observance of international standards. Penitentiary Service spokesman Ihor Andrushko told The Associated Press that Tymoshenko has been offered medication, massages and other procedures for her condition to be administered inside the prison. He said Tymoshenko had refused the offer. Tymoshenko, who also faces as a slew of other charges and investigations, denies all the accusations and claims that the criminal cases against her have been orchestrated by her archenemy President Viktor Yanukovych to remove a powerful political opponent and bar her from parliament elections this fall. Tymoshenko narrowly lost the 2010 presidential race to Yanukovych. Her lawyer Serhiy Vlasenko said the treatment offered to Tymoshenko by prison doctors, like drawing spinal fluid on the premises of the prison, is dangerous. “It’s as if your leg is broken and they tell you to go play football to get better,” Vlasenko told the AP. Tymoshenko was found guilty last year of overstepping her authority during a tense natural gas pricing dispute with Moscow in January 2009. The court ruled that she wasn’t formally authorized to order the signing of a new gas contract, which significantly increased the price Ukraine pays for Russian gas imports. Tymoshenko says she was within her right to lead the negotiations as the country’s prime minister and says sealing the deal with Russia was the only way to restore supplies to Ukraine and other European countries during a winter freeze, which were caused by the dispute.